Customers deserve what is right. So for any hotelier’s goal is to provide comfort and ease for their guests and visitors; a touch-enabled technology can be the perfect solution to achieve this. From a projected capacitive (PCAP) touchscreen monitors to panel PC displays, the hotel industry is the reason why touch technology becomes a widespread in the market these days. It is originally built to create an impression. But, such innovative solution also adds value to customers’ experience. So, as the development of service and accommodation evolve, the increasing popularity of PCAP technologies befits hospitality services. Keeping pace with the latest trends in technology can be quite an overwhelming practice for hotel owners. But, with the wide array of demands such as the security of series of hospitality events keeps the industry of their toes. If you are large hotel operator, you might be considering this for your business. Besides, touchscreen displays enables your clientele imagines what the future of hotel industry would be like. At this point in time, a variety of hotel chains are already using the following technologies. Their objective is to create a technologically advanced hospitality environments. Placing internet kiosks as information centres minimise the needs of the guests to wait for their turn just to ask simple questions. These kiosks are enclosed with panel PCs connected to the hotel’s internet system. Of course, these must contain all the necessary hotel information such as directions, restaurant recommendations, guides to nearby attractions, and more. You can also include critical details about flights, weather conditions, and other local data which may be useful for your guests and visitors. If your hotel also offers events and trade shows, the right use of touchscreen technology allows both of your clients and organisers to keep in touch on a real-time basis. Plus, the utilisation of such kind of technology facilitates service automation in many ways. This also adds value to your hotel offering applications and systems that are innovative yet entertaining. Thus, intelligent applications significantly influence customer loyalty and satisfaction. An interactive technology is on its way to going mainstream. PCAP touchscreens will become a necessity. It is being adapted for streamlining processes, guiding customers, marketing, and communicating employees. Just imagine a scenario like this. 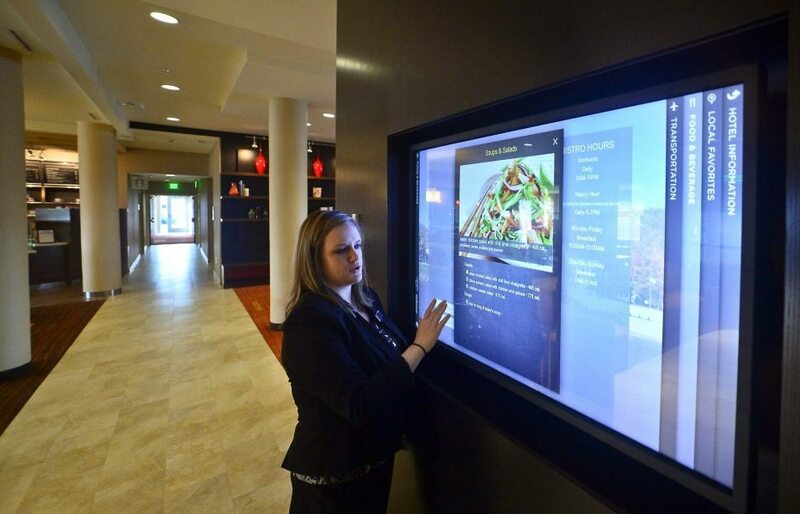 As soon as your customer walks in to your hotel, they are greeted by large interactive touch panel displays. Wouldn’t it be great to captivate the eyes of your customers with the flashing animations on the display? When they enter the lobby, the virtual concierge might show some images of their nicer rooms available along with its luxuries and a sneak peak of the view from the balcony. Once the guests went in to their options, touch-enabled monitors allow them to control their preferred accommodation such as light, water, cable, and room service as well. You see, it is inevitable that guests would likely make use of them. With the access of these hotel facilities at their fingertips provide a memorable experience. Would you want to know more how a projected capacitive touchscreen technology can benefit your business? Contact a PCAP expert today for more info.